I don' think it's official yet. BUT it looks like the American housing market may have stopped hemorrhaging. How do I know? Well, I don't know for sure, but in some of the worst hit areas in the States, there has been a turnaround with prices in places like long-suffering Florida and sucker-punched Arizona. We know it's not the same all over the U.S. The sunniest states, with the most secondary properties, were hit the hardest whereas places like New York City remain a pricey place to live. Wherever they live, most Americans are good and ready for any sign that their real estate market may be improving. There has been roughly 9 million Americans who have defaulted on their mortgages. Properties in some locations are now worth less than half of what they were at the peak of the housing market. So we all know how the Yanks have suffered. But it's not just about stats on the States. I just returned from a trip to Europe, where the Americans I met while I was there, were downright giddy about their real estate market. I have not seen giddy Americans in a long time. I don't think they had any illusions that things will become robust and return to the heights they were at in 2006 and 2007 any time soon. After all, the banks still have quite a bit of foreclosed homes in their possession and unemployment in the U.S. is stubbornly high. Still, it's nice to see some warm and fuzzy feelings about real estate for our southern friends. As Canadians, who have not suffered like Americans, you might think it really doesn't matter what happens down there -whether the news is good or bad. You may believe that our housing markets and mortgage rules are so different that Canadian and American real estate really don't effect one another. After all, our housing market didn't take a nosedive when theirs did. So, what effect does an improving American housing market have on Canadians and their housing market? The truth is, quite a bit. We Canadians are buying up a lot of the property in those sunny American states. And who can blame us? Our strong dollar makes American homes much more affordable and prices are at an all time low. So, we invest there and not here on vacation homes. We are some of the foreign buyers who are gobbling up U.S properties and helping their housing market recover while not overheating our own vacation property market. But we are not the only ones. Other nations from Europe, Asia and the Middle East are now also looking to the the U.S. to buy property. There is a feeling that things are stabilizing there and ready to appreciate. So foreign investors who have invested heavily in Canada over the past 4 years, because we had one of the few stable housing markets in the world, are now looking to the Americans for deals. Is that such a bad thing for Canada? I would say no. Quite the opposite. There has been some concern that there is too much foreign investment in Canada in the past 4 or 5 years. 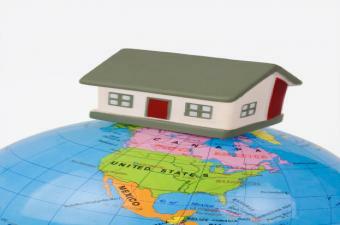 Canada does not keep track of foreign investment in the housing market at the moment. They should. But they don't. The worry is that if there is too much foreign investment in one city or country, then if some thing goes wrong, those investors will pull out all at once and cause the housing market to become unstable. So, the fact that more foreign investors are considering the States means that there could be fewer in Canada. So, in turn, the worry of foreign investment overwhelming the Canadian housing market becomes less of a concern. Now, if you don't really buy any thing I'm saying here, fair enough. These are not all foregone conclusions. These are just a few educated ( or maybe whimsical) predictions. But I can see the early buds of an American recover that I think will help to keep our our own housing market healthy and steady. To Rent or Not to Rent - Is That the Question?